In Casino Royale, James Bond (played by Daniel Craig) wears two pairs of Persol frames during the film. 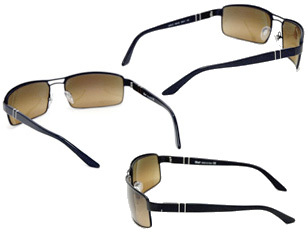 At the start of the plot, Bond wears a Persol metal frame: Persol 2244. In the second part of the story after experiencing a number of adventures, James changes to Persol style 2720. There is only one version that is the correct one (as seen in the movie), and that is the Persol 2244 with Brown lenses, color code 834/33. Look out for polarized and non-polarized versions of these glasses. These glasses do not come in a special James Bond box, but in the regular Persol box (the same, but without an embossed James Bond 007 logo).